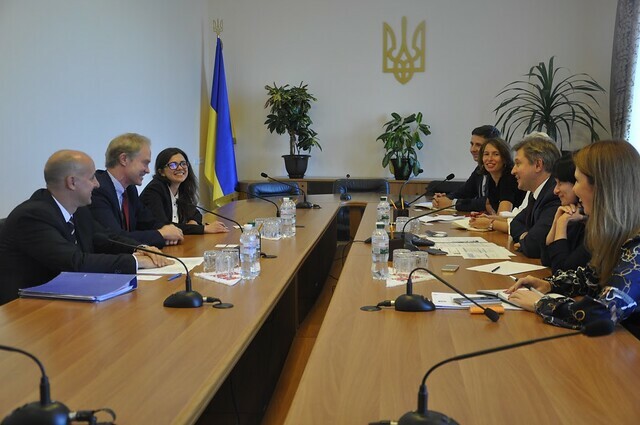 On 27 September 2017, an OECD delegation met in Kiev the Ukrainian Minister of Finance Oleksandr Danyliuk to discuss the progress of the country in implementing the new international standards to combat tax avoidance and tax evasion. Ukraine is an active member of the Inclusive Framework on Base Erosion and Profit Shifting (BEPS) and the Global Forum on Transparency and Exchange of Information for Tax Purposes (the Global Forum). The visit launched a joint induction programme to assist Ukraine in the implementation of the new international standards, namely the BEPS package with a focus on Country-by-Country Reporting and the other BEPS minimum standards, and the standards for exchange of information on request and for the automatic exchange of financial account information (the “Common Reporting Standard”) on which Global Forum members are working together to monitor and review implementation. The monitoring and review process is intended to ensure the effective and timely delivery of commitments made, the confidentiality of information exchanged and to identify areas where support is needed. Ukraine has developed a detailed Roadmap for the implementation of the BEPS minimum standards and plans to join the Multilateral Instrument (MLI) before the end of the year in order to implement the tax-treaty related minimum standards of the BEPS package. Furthermore, Ukraine intends to start the automatic exchange of information on financial accounts of non-residents under the CRS as of 2020. As part of the visit, a workshop on the implementation of the new international tax standards was delivered on 28 September 2017 to senior officials from the Ministry of Finance and the Ukrainian tax administration.